1996 reprint, Thomas Nelson, 755 pages plus 68-page Topical Index. India paper, hardback. This gives the keen bible student an easy way to understand the meaning of the original Greek term used in Greek Scriptures – invaluable resource. 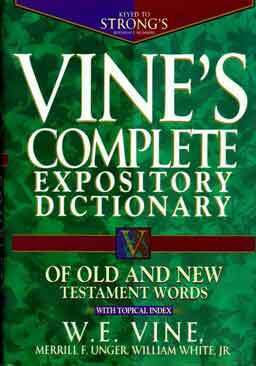 Vine, Unger and White’s Complete Expository Dictionary of Old and New Testament Words makes it possible for the student with substantial, limited, or no background in either Greek or Hebrew to study the meaning of biblical words in the original languages. English equivalents are listed alphabetically throughout the text, along with either Greek or Hebrew words from which they are translated. Various shades of meaning, plus Scripture passages illustrating particular usages, are also included. Through the extensive use of Strong’s numbering system and other references included in the indexes, you will be able to bridge Vine’s entries with those of the standard technical lexicons used by Bible scholars everywhere. -enrich your Bible study with the only complete Expository Dictionary to Old and New Testament Words by W.E.Vine, Merrill F. Unger and William White, Jr, which is keyed to Strong’s Reference Numbers.